One of the most serious issues with using medical equipment in the developing world is breakage. Some statistics state that the average life of a large piece of machinery is about 5 years, and hospitals typically have stockpiles of broken machinery that they cannot use. The problem is availability of spare parts. In some cases machines are taken out of service for minor problems, even fuse replacement, because the distribution network required to get the part does not service that area. 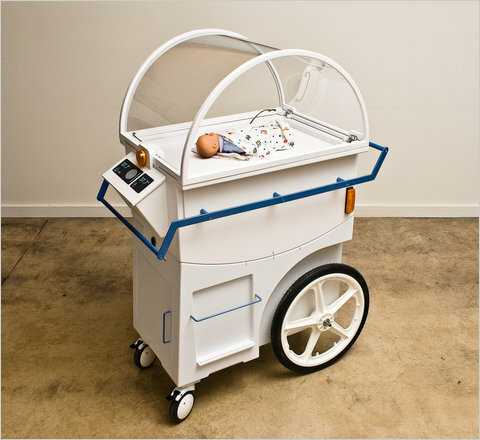 Here in Cambridge Massachusetts, a design company has produced as prototype of a baby incubator for use in such situations. The machine has all of the necessary functions of the most expensive incubators, but is built using car parts. Why car parts you might ask? Cars are found everywhere, and in many cases they are the only things that get regularly repaired. As a result parts are also available practically everywhere, both formal and informal networks serving even the most remote areas, and the designer believes that this makes the prototype product serviceable and repairable wherever it is found. A simple idea that could have great knock on effects, I hazard to say. The incubator is heated using a pair of car headlights placed under the mattress, the temperature gauge is a car standard, as is the wiring loom and the air intake and filters. The alarm is a door bell and the emergency lights are direction turning indicators. If power is lost a motorbike battery takes over and it can even be run from jump leads. The Massachusetts General Hospital has one of the prototypes on display in its museum, but unfortunately it looks as if the designers are still looking for a backer in order to put the project into mass production. Given that millions of babies are born each year and many die on their first day of life, let us hope that somebody offers them some funds. I am going to be honest Jonny, such issues never even crossed my mind, but thinking about it, they are actually really serious, and could save hospitals hundreds of thousands, if not millions every year! Good, I hope I can continue. To be perfectly honest life in Cambridge Massachusetts is so full of interesting people and stuff related to technology that I am overrun with topics to cover. It is promising idea that these people have had and I hope it works out. It is true that car parts can be available almost anywhere. Even parts for very old cars can be obtained with some searching. Hopefully, they find a backer for their project. What a great and innovative way to fix a huge problem. They are right car parts are everywhere and why not use them to make better more accessible products. Its always inspiring to see new innovations taking place through “not too complex” techniques. This incubator is certainly one such thing. I came across another such fascinating innovation by MIT people. Yes I had a look at the link, they do some great stuff at MIT. What a genius idea! It is not only a good alternative to original incubators but it is also a great way to recycle those car parts. Sponsorship from car manufacturers or dealers would be a great way to fund this project. I like the idea too Sam, I think as resources become more and more scarce, this is the sort of thing we will need to be doing more and more of in the future, to ensure everything is exploited to its full potential, before being recycled! What a fantastic idea. Using common parts to make machinery that can save children’s lives. What a shame it is not in actual production. Maybe a non profit organization could pick up on this. I have chatted online a couple times with a heart doctor in India, who only works on children. He also has a non profit company and does a number of surgeries per year on children who’s family’s cannot afford the surgery. There are few children’s heart doctors in India. We really don’t have a clue how bad it is in some other countries, unless we research and look into it. I think it is really sad that because of the nature of the medical industry, treatments/equipment is often so expensive. What a great idea, it’s better and good alternative to recycle the car parts. After getting through your post I got some useful and helpful information as well as inspiration. I’d like to say thanks for sharing this wondeful information here and keep posting such a great and useful posts.